The heat from the pasta helps wilt the arugula – a great no-cook technique for adding vegetables to your pasta recipes. Try it with spinach, too. 1. Bring a large pot of water to a boil; cook pasta according to package directions. Drain but do not rinse. 2. Meanwhile, in a large serving bowl, combine lemon juice, lemon zest, sour cream, salt, pepper and 1/2 cup plus 2 tablespoons cheese; set aside. 3. Immediately pour drained noodles into sour cream mixture; toss to coat. Add arugula; toss again to combine completely. Serve immediately with Parmesan cheese sprinkled over top. Finish with more salt and pepper, if desired. Yields about 1 1/2 cups pasta plus 1 tablespoon cheese per serving. 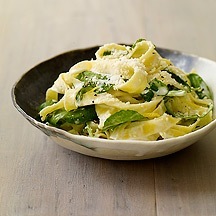 *If you can’t find tagliatelle noodles, use egg noodles instead (could affect PointsPlus value). You’ll need about 2 medium lemons for the zest and juice.